The story you find within the pages of this book is completely different and incredibly unique. It's almost as if you are getting two stories. Hannah, 29 and still searching for a place to plant some roots, finds herself back in LA living with her best friend and her husband. Looking for a fresh start she finds herself at a crossroads her first night back. Should she return home with her friend Gabby or should she say yes to spending more time with her ex Ethan. This seems like such a simple question, but as the story plays out, exploring both options, you find each of the roads will lead Hannah down different paths. They both result in a HEA but each one is quite different. Taylor Jenkins Reid is without a doubt a compelling storyteller. I found myself completely entranced with both story lines, finding it hard to put the book down because I just wanted to know what was going to happen next. She cleverly tells Hannah's story with alternating chapters, and don't worry I never found myself struggling to remember which path was being travelled, clearly a result of flawless writing. The ending left me somewhat surprised, not to mention a little confused as to my feelings on the overall story. But after several days of reflection I realize in choosing to close out the story in the way she did was quite brilliant. I believe Taylor Jenkins Reid wants to push our limits as readers, to challenge us to think outside the "norm." 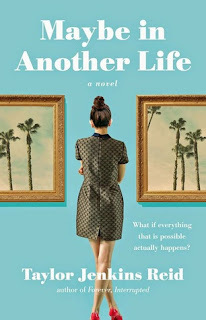 Even now, 2 weeks from finishing Maybe in Another Life, I am STILL thinking about this story. Seriously! The characters are interesting and complex and nothing about this story is cut and dry. I recommend you make the time to read this book, it's truly an unforgettable one of a kind escape!